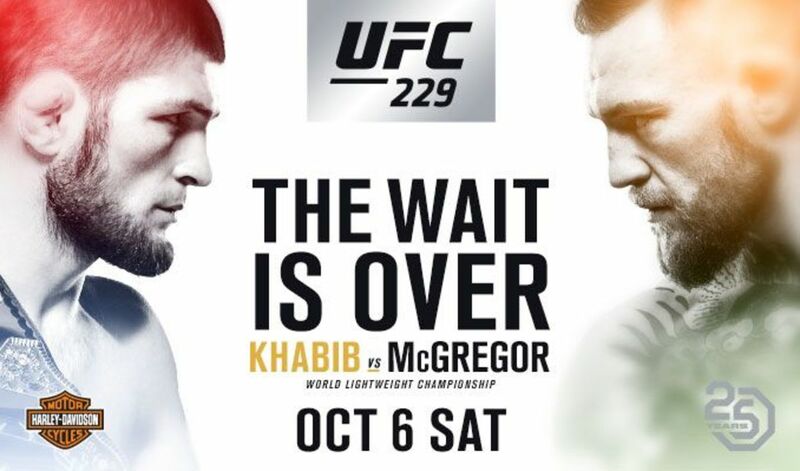 Promotion for arguably the most anticipated UFC fight of the year kicks off Thursday at 5 PM Eastern as UFC lightweight champion Khabib Nurmagomedov and former UFC lightweight champion Conor McGregor will go face to face in New York City at a press conference. The two will face off in the main event of UFC 229 on Saturday, October 6th in Las Vegas. This will be Nurmagomedov's first fight since winning the then-interim title in a dominant decision over Al Iaquinta in April while McGregor hasn't had a UFC fight since he beat Eddie Alvarez for the strap in November 2016. Much of the video promotion for the fight has stemmed from McGregor throwing a bus dolly through a window that Nurmagomedov was sitting on during the UFC 223 media day in April. McGregor later worked out a plea deal with New York State for the attack which injured several fighters. In the co-main event, former interim lightweight champion Tony Ferguson will face former lightweight champion Anthony Pettis. Ferguson was scheduled to face Nurmagomedov at UFC 223 but had to withdraw due to a freak knee injury. It's expected that if either McGregor or Nurmagomedov has to bow out of the fight, Ferguson would tabbed to replace them.